Today, Cassini is about to once again bravely go where no spacecraft has ever gone before: into the gap between Saturn and its massive rings. Although we’re all eager to see the outcomes of Cassini’s second dive, astronomers are still analyzing the discoveries from her first. Seemingly, the orbiter’s first dive between Saturn and the gas giant’s rings, on April 26th, exposed that this secretive, unfamiliar region is pretty much devoid of particles. Cassini Project Manager Earl Maize called it “the big empty,” which is like something from Stranger Things, but you know, in space. Perhaps the most fascinating aspect of Cassini’s mission into the “big empty” was the “sounds” it picked up from particles—or lack thereof—in the gap. 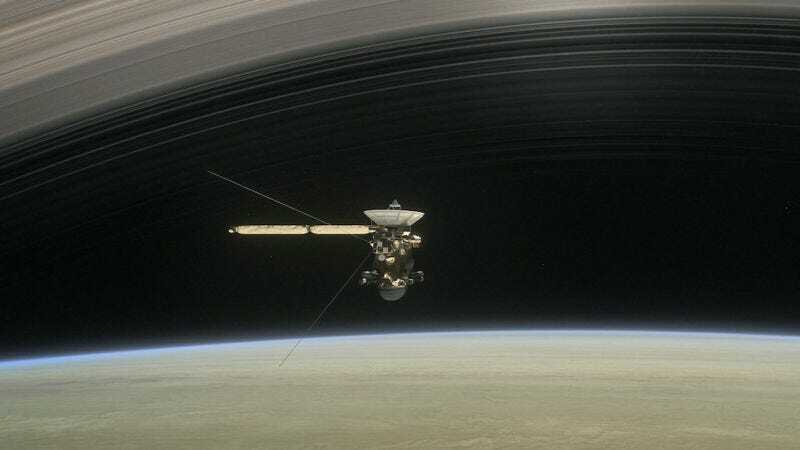 According to NASA, Cassini’s Radio and Plasma Wave Science (RPWS) instrument “detected the hits of hundreds of ring particles per second” vaporizing into electrically-excited gas when it was just outside Saturn’s main rings, but within the gap, it detected very few.